Working from our headquarters in an impressive 16,000 square-foot office building recently renovated in Livingston, Vanco Construction employs a professional office staff and talented craftsmen in the field. Steve Vanadia maintains continual involvement in the building process, often visiting jobsites daily. 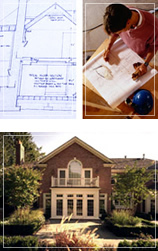 Design and layout, construction methods and material selections are all among his areas of expertise. Steve is also in constant communication with the client, encouraging them to offer suggestions and become immersed in the design and construction of their dream. Throughout the Preliminary Budget process, you sit with our project manager to describe in detail your desired project. During the Value Engineering stage, Vanco reviews your plans and presents various ways to maximize your project budget and/or save money. From there, Vanco will organize and present the Contract Estimate. Our relationships with leading manufacturers and service providers can bring the most unique and unusual touches. Our construction crew takes your dream to reality by expediting the Construction process - delivering on time and within budget.